In Oslob, Cebu, whale shark watching is the ultimate suggested activity. Needless to say, you must swim with the whale sharks. I don't encourage you to swim with the whale sharks though, but that's another topic. 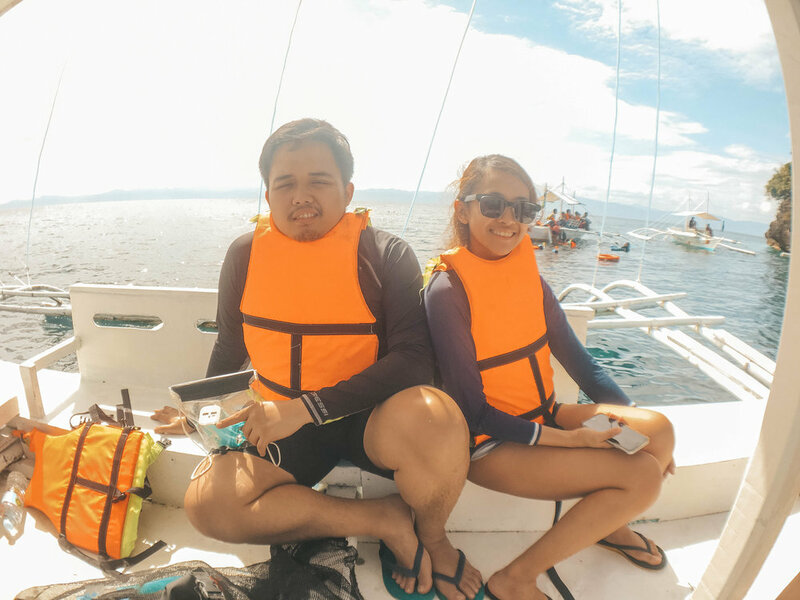 It's our second day in Cebu, and our first activity is whale shark watching! Our itinerary for this day wasn't as packed as yesterday. All of us had to be ready by 4 AM still. It wasn't a problem because we all had a good night sleep. Our travel time to Oslob only took 1h and 45m. Thanks to our driver, we were able to arrive early. I was asleep almost the entire trip, when we arrived it was already raining in Oslob. I have no idea how long it was raining, but it stopped! Yay! Take note, we arrived there at 5:45 AM. Lots of people already filled the place! I didn't expect it. I thought we were there first. Haha! Whale shark watching is in a small barangay in Oslob, which is Tan-awan. We traveled by van though, but it's easy to commute from Cebu city. Ride Ceres Liner bus (in Center wing) going to Oslob. Check the schedule here. The usual travel time is 3 to 4 hours depending on the traffic. You can either ride an air-conditoned bus or an ordinary one. Ask your conductor to drop you off at whale shark watching briefing area in Brgy. Tan-awan. It's along the highway, so you could see it right away. How to sign up for whale shark watching? The tour package that we availed includes this activity already. But, if you want to get a tour, you might want to check out Happy Juanderer. Meanwhile, there is no reservation; it's a first come, first serve basis. It's not a whole day activity though, it is only open from 6 AM to 12:30 PM everyday. No wonder people want to arrive there early. Before we start, our tour guide asked us whether we will just watch or swim with the whale sharks. Apparently, the fees depend on it. The fee includes the boat ride and one ticket is good for 30 minutes only. The briefing/orientation will start at 6 AM. They are requiring every tourists to attend the briefing. All important notes are discussed here; you can also raise your questions after the briefing. Remember your group number. They will attend to your group one after another. Right after the briefing, you will now proceed to wear your life vests and get your snorkeling gears. There are no rules on what you should wear. Just wear your most comfortable clothes! Honestly, it was disappointing when I saw the boats near the shore. I was expecting that we will travel and go to the whale sharks. But, apparently, it's the other way around. The boatman told us that the whale sharks go there on their own because of the food. But they are definitely not within a net. Still, it's disappointing! I still feel like they are imprisoned there for the tourists. I was hesitant to go down the water, but I still tried it somehow. It was a great experience. 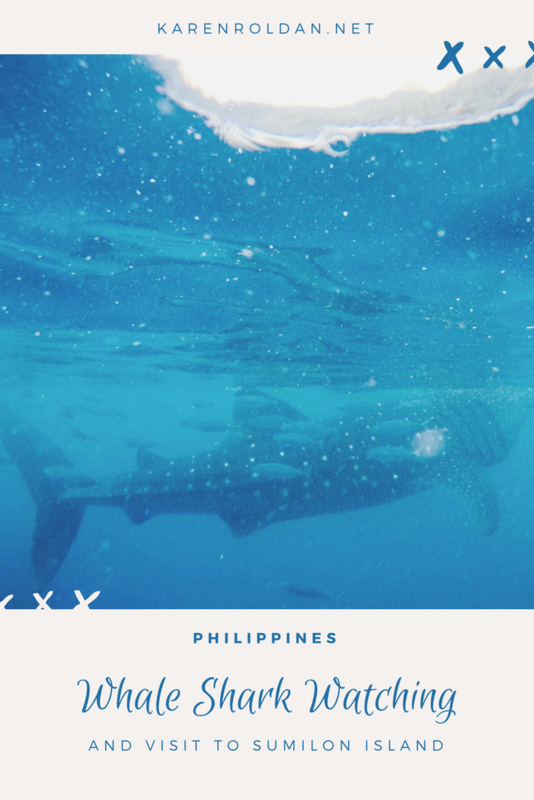 Though the whale sharks are far from us, I still panic because of its size. Every group has only 30 minutes to swim with the whale sharks. My friends enjoyed it very much, but I went back to the boat after 5 to 10 minutes of being in the water. When we went back to the shore, they are already calling the group number 80 and above. See how many tourists went there? The boatman mentioned that it was not as packed as the usual. I cannot imagine the number of tourists that go there to swim with the whale sharks! I cannot share more pictures because our photos are full of butts! Haha. The struggle of taking a photo of/with a whale shark is real. I had so much fun especially when we all panicked and got excited when the whale shark comes near us, and of course, we can't take a proper group photo because of that. 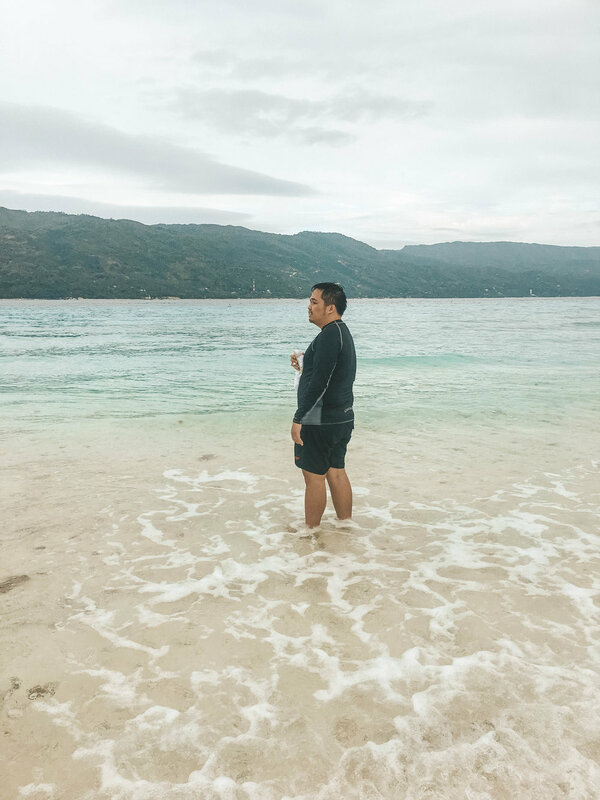 After we finished watching and swimming with the whale sharks, we didn't take a shower yet because we headed straight to Sumilon Island. From the briefing area, we walked for less than 5 minutes to the highway and waited for a pickup car. There's a boat waiting for us already, so we just hopped in and traveled for 15 minutes. We got there around 7:20 AM, so there were fewer people. By the way, Sumilon Island is actually a private resort. Bluewater Sumilon Island Resort owns it, but they let non-resort guests enjoy the sandbar. There is a fee, but I forgot to ask how much (sorry!). We were lucky because we still got to see a good part of the sandbar. My friends and I stayed there until 10 AM to have an early lunch. Besides, a lot of people are already arriving. Don't forget to bring cash, by the way! In case you need to use the toilet, there is a fee of Php 20 per person. As I have mentioned, Bluewater Sumilon Island resort owned the sandbar, so basically we need to pay for everything. We went back to the briefing area to have lunch, then we took a shower. We all decided to take a shower late so we don't need to queue together with lots of people. It has 3 shower rooms and limited water. How was your experience in swimming with a whale shark? Do you encourage it? 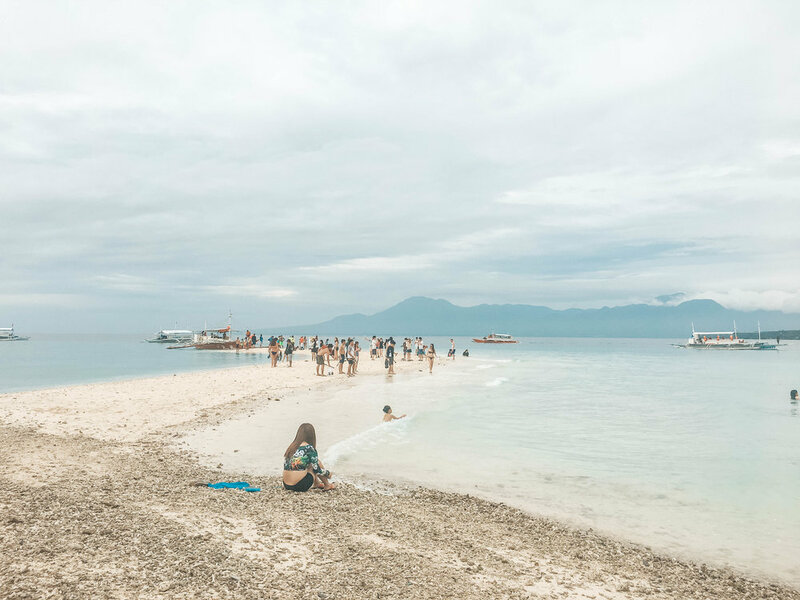 What are the other things to do in Sumilon Island?